Consistency is one of the most important aspects of achieving any goal. Sticking to your meal plan is essential and will produce incredible results quickly. That’s easier said than done! Here are five tips for sticking to your meal plan and not missing those metabolism building meals! I rely on my stash all the time! In fact, I keep multiple stashes around. I have a truck stash, an office stash, a stash at my Dad’s house, and a gym bag stash. What’s a stash? For me, it’s whey protein sample packs, tuna packs, and raw nuts. A stash should be a quality source of protein, fat, and carbs that are not quickly perishable that you can depend on if you’re stuck without a meal. Life is often unpredictable and sometimes your days just don’t go how you planned! That’s okay if you’re prepared. 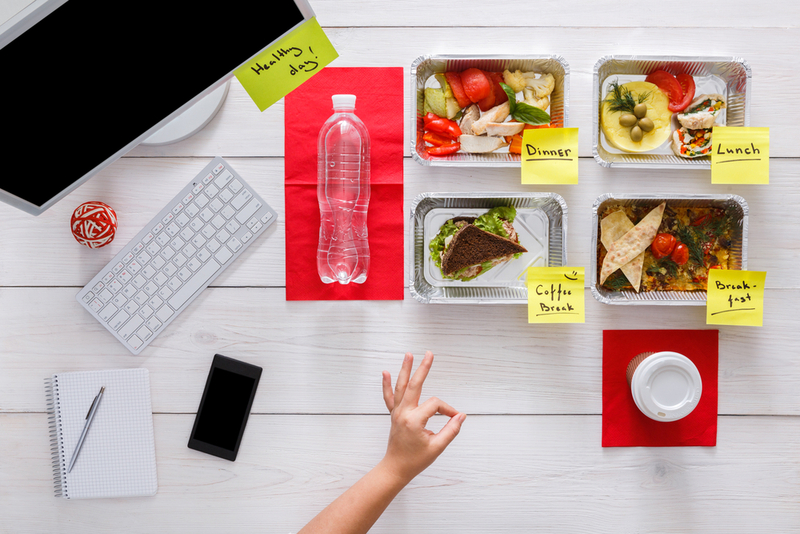 If you have a stash of foods that fit your meal plan, it’s very unlikely that you will need to miss a meal or rely on unhealthy foods to sustain you because you don’t have access to any clean food. You know those survivor shows, where survival experts can turn a barren desert cave into a livable bungalow and eat a three-course meal before bed? That should be you when it comes to sticking to your meal plan! Make something out of nothing. For instance – how to navigate a convenience store or gas station when you need to eat and you don’t have food, your stash is empty, and restaurants are closed. “Health Foods” can be a trap. Sports drinks, granola bars, mixed nuts, and most other items marketed as “health” food are usually very calorie dense and were designed for people in endurance events. Your road trip may require endurance, but not the kind that requires intra drive glycogen replenishment! My favorite go-to is beef jerky – the sodium content is high, but it’s high in protein and low in fat and carbs. If you want fat or carbs, you can add in a single serving of nuts or be one of the one in 1000 people that buy the fruit at the gas station. Protein bars can be hit or miss and the same with protein shakes. Just make sure you check the nutrition facts to avoid unnecessary calories from sugar or fat. Make sure the meat is cooked with no butter or oil (it often is). As for any and all sauce, get it on the side (this can sometimes cut the calories by 25-50%). Get certain items steamed instead of pan fried, fried, or any other method that involves using fat to cook a would-be healthy food choice. Just ask for what you want! If you can’t make a good combo using their preset menu, just ask for what you want. They’ll often make it for you. For me, and most dieters, the stomach grumble is timer enough. But if you’re trying to add muscle mass and living in a calorie surplus that doesn’t leave you hungry or you have a slow metabolism and meal frequency is a struggle, then set yourself a timer. Use a phone or watch and set a timer so you don’t forget. Keep shakes nearby in case it’s time to eat and you’re not in a setting to pull out a meal. That way you don’t end up trying to make up for lost time late at night or missing meals altogether. Greg, I have a serious problem with eating all my meals on my meal plan. Four meal’s a day to me is a lot. Luckily, I’m working really hard to eat all of them, and when I do, I actually feel proud of myself. It’s as if I like to play a game of “will she eat everything designed specifically for her before the end of the day”. My response is always; ‘Challenge accepted’. I sometimes have to text a girlfriend to tell her how good I did. Not that I’ve ever had issues with food, I love food. It’s just the frequency and the amount spread out over the course of the day that feels like my day is consumed by eating. I am fairly fine eating two to three large meals and going about my day……..but!!! !….then I leave room for the occasional snacks. Which is unfair to my body and it does leave me feeling guilty I ate a family size tortilla chip bag. Being on Meal prep(which I have done in a few occasions) has taught me how only one week of clean eating can give me significate aesthetic/gastrointestinal changes and by far better-prolonged energy throughout the day, rather than having a midday energy crash or mid-afternoon slump. It would be awesome if you could YouTube video of some healthy finds at a gas station or an airport, I think those are the places we all get tempted to slip up. Thanks for the read. Hey Mariuxi! Thanks for sharing! Yes that can be tough – I think 4 meals is plenty, there are even some top level bodybuilders that are preaching less meal frequency, as opposed to the norm in our industry of 6 meals per day. But as I always say, the best plan is the one you can stick to, so a “diet” that fits your lifestyle, makes you feel good, improves your health, and makes you look good naked is a win haha.. Lack of hunger can sometimes be a sign for a slowing metabolism though so important to make sure that’s not a symptom! Great idea – I’ll do it! Three Questions to Ask Yourself Before Competing (or before competing again... Don’t Fear the Scale!